Home > Timing Belts MXL-XL-L-H... > MXL Metric Timing Belts. 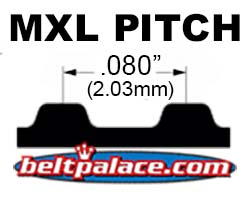 Trapezoidal Tooth Gear belts - 0.080" Pitch > 95MXL3.2G Timing belt. Industrial Grade 95MXL012. 95MXL3.2G Timing belt. Industrial Grade 95MXL012. 95MXL3.2G Timing Belt. Industrial Grade. 7.6” Length. 95 teeth. 1/8” (3.2mm) wide. 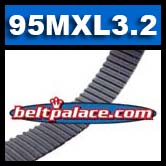 Neoprene (black rubber) “95-MXL Series” industry standard Timing Belt. Replaces electronic motor belts, power tool drive belts, woodworking tool belts, pump belts, and gear belts for robotic equipment. Toothed Gear Belts marked “95MXL” at 1/8” Width. Imported Richeng/Great Wall/Belt Corp 95MXL012 NG. Leisure Bill Validator for Vending Machine Belt: 95MXL012. Quantity orders may qualify for shipping discounts. Call for details! 52MXL03.2G Timing belt. Industrial Grade. 52MXL3.2G HTD Timing Belt. 4.16” Length, 65 teeth, 1/8” Wide. Neoprene HTD 52MXL-012 Timing belt 52MXL-3.2G. Industrial Grade.